The following scenario might happen when trying to write to a view after the underlying table has been updated. The example uses a table that is first created with a column allowing nulls. A view is then created on top of it and then the table is updated to not allow nulls for the column. Writing to the view using SSIS (with default settings) will fail until the view is refreshed to take the current table definition into account. 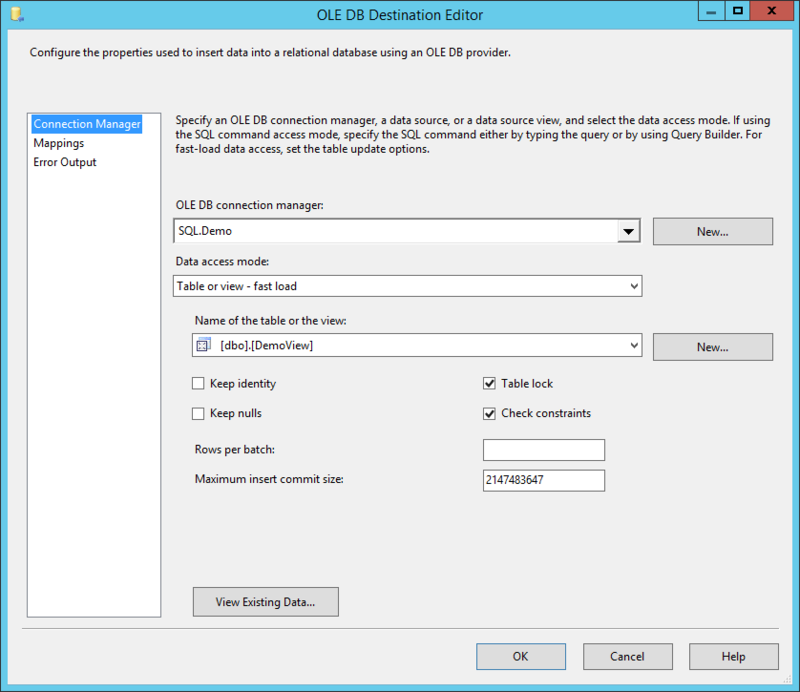 This scenario uses SQL Server 2014 and Visual Studio 2013 SSDT BI for SSIS. 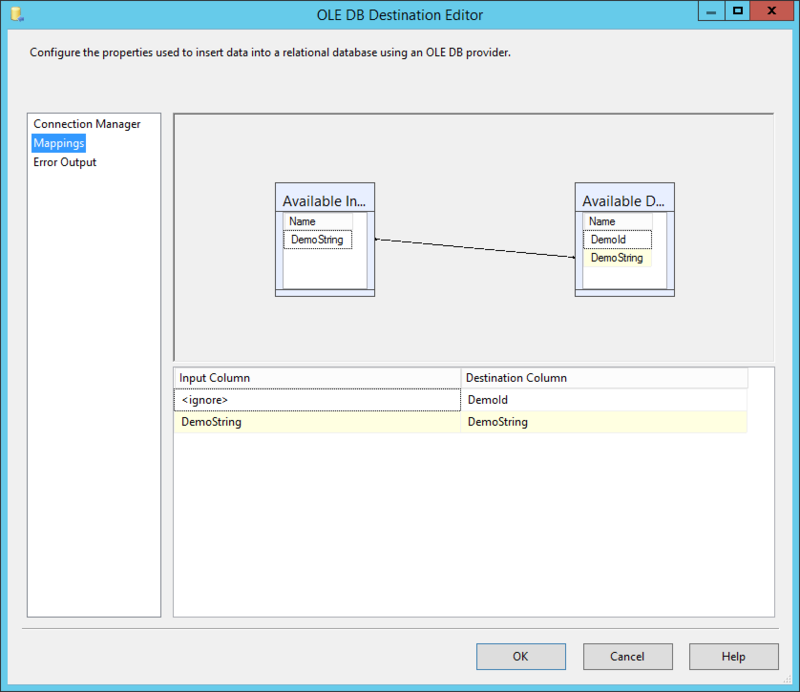 [OLE DB Destination ] Error: SSIS Error Code DTS_E_OLEDBERROR. An OLE DB error has occurred. Error code: 0x80004005. An OLE DB record is available. Source: "Microsoft SQL Server Native Client 11.0"  Hresult: 0x80004005  Description: "Invalid column type from bcp client for colid 1.". 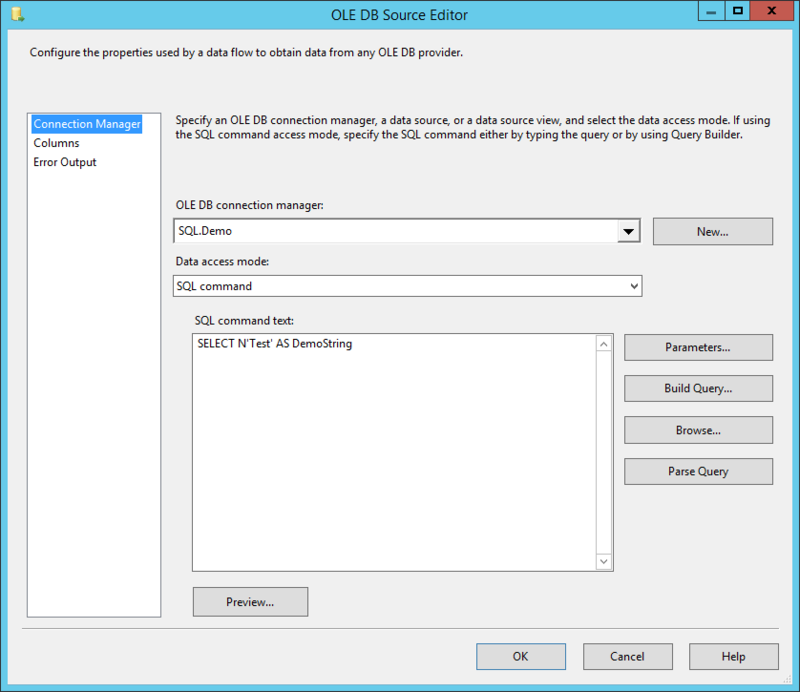 [OLE DB Destination ] Error: SSIS Error Code DTS_E_INDUCEDTRANSFORMFAILUREONERROR. The "OLE DB Destination.Inputs[OLE DB Destination Input]" failed because error code 0xC020907B occurred, and the error row disposition on "OLE DB Destination.Inputs[OLE DB Destination Input]" specifies failure on error. An error occurred on the specified object of the specified component. There may be error messages posted before this with more information about the failure. [SSIS.Pipeline] Error: SSIS Error Code DTS_E_PROCESSINPUTFAILED. The ProcessInput method on component "OLE DB Destination" (2) failed with error code 0xC0209029 while processing input "OLE DB Destination Input" (15). The identified component returned an error from the ProcessInput method. The error is specific to the component, but the error is fatal and will cause the Data Flow task to stop running. There may be error messages posted before this with more information about the failure. Recreate the view, such as with this alter statement. This entry was posted in Business Intelligence and tagged BI, Business Intelligence, error, SQL Server, SSIS on 2014-11-06, Thursday by Stefan Johansson.